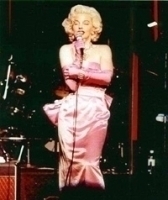 Her physical resemblance to Marilyn Monroe was soon discovered as well as her ability to impersonate the voices and looks of Marilyn,Liza Minnelli, Madonna, Faith Hill, Judy Garland,Olivia Newton John, Alanis Morissette and many others. She has since stacked up an impressive list of credits in film, T.V., and music video portraying Marilyn in Showtime’s “Out There,” the Disney Channel’s “Munchie Strikes Back,” the T.V. shows “Clueless,” “The Other Side,” and “The To Tell the Truth,” the music videos of “The Rembrandts” and “Ministry,” and most recently a commercial for Toyota. She has appeared on numerous overseas broadcasts and has been the subject of newspaper articles and TV interviews both locally and internationally. 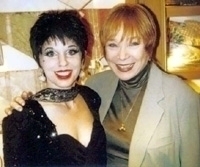 She lights up the stage portraying both Marilyn and Liza in: “A Really Big Shew” at the Tropicana in Atlantic City and the Reno Hilton; “A Tribute to the Divas” in Palm Springs; and Ron Stein’s “Hollywood Stars” at venues in the U.S. and abroad. She has also made special appearances for Legends in Concert, Mercedes Benz, McDonalds, Universal Studios, Paramount Pictures, and the Debbie Reynolds Hotel & Casino for which she modeled the original “Seven Year Itch” dress worn by Marilyn Monroe(It was a perfect fit!). So no extraordinary talents on her matter how you see her, she is an artist/singer/ entertainer of way to the top!